1. Soar across a lush rainforest. You’ll take a narrated ride along the Hilo/Hamakua coastline and arrive at the seven-stage zip line course that soars to heights of more than 200 feet. You’ll hike from one line to the next — amid gurgling streams and waterfalls — and cross a suspension bridge that cuts through the jungle. Note: Kids must be at least 10 years old or 70 pounds to participate ($198 per person; celebritycruises.com). 2. Race with the dogs. 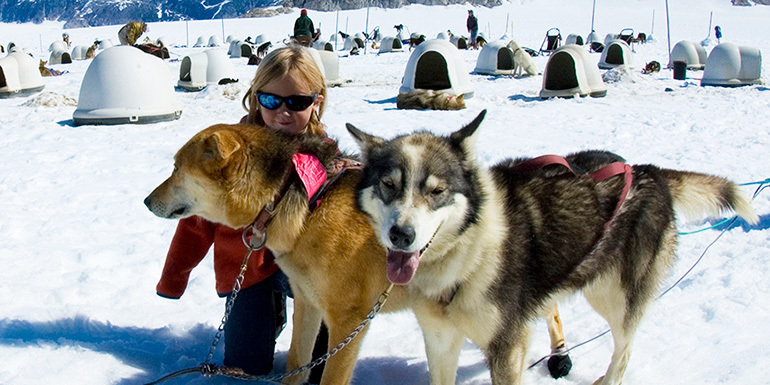 This family-friendly tour begins with a breathtaking helicopter ride over Juneau’s ice field, followed by a behind-the-scenes tour of the Alaska Heli-Mush, where sled dogs of the Iditarod are trained. From there, you and your kids get to help prepare your team of huskies for a sled trip through the pristine wilderness. This 4 ½-hour adventure is reserved for kids ages 5 and up ($709 for adults and kids 10 and up, $499 for ages 5 to 9; disney.com). 3. Hike to a spectacular waterfall. If you love being close to nature, you’ll want to sign the family up for Carnival’s combo horseback ride and climb to Dunn’s River Falls. This tour begins with a horseback ride through the rain forest. Then, you’ll be taken to Dunn’s River Falls, where you’ll climb the world-famous 600-foot cascading falls. Since this is a strenuous trip, it’s reserved for kids 6 and up ($130 for adults, $100 for kids; carnival.com). Families cruising on the Norwegian Gem, Norwegian Pearl, and Norwegian Sun get the chance to interact with a dolphin. As you descend the stairs at the Prospect Reef Facility into the Caribbean Sea on a submerged platform, dolphins will swim right by you and even come in for a kiss. You’ll see them do a “fast swim,” too, which demonstrates their incredible speed. Note: This is for kids ages 4 and older ($129 for adults, $99 for kids; ncl.com). 5. Run like an Olympian. With a guide by your side, you’ll visit the Statue of Zeus, hailed as one of the Seven Wonders of the Ancient World, and the Temple of Hera, where the original Olympic Torch was lit. To cap off the day, dust off your sneakers and run in a short race along the original track. Best of all, every child who participates gets a prize. Note: This excursion is available until November ($69 per person; princesscruises.com). What shore excursions do you think are the most fun to do with children? Hello, cruise tour is the best option to roam different countries and also to know the various things regarding the ocean history. Recently I visited Caribbean island with the help of a well-known yacht broker yachtcharterbook which is so beautiful and mind blowing unable to express the beauty of the place.